CRA = chief ray angle. The effect of the sensor receiving light is related to the sensor itself, and on the other hand, it has a great relationship with the angle of light incident on the Sensor. CRA is associated with illumination on the original photographic film, and if the efficiency of the light on the CMOS or CCD sensor is not only related to the CRA, it is also related to the Sensor’s Micro Lens opening layout. Therefore, when doing Lens design CRA to meet the sensor manufacturers to provide the CRA reference value, so as to match their Sensor layout, improve the efficiency of light reception. The interface between the camera and the sensor is one of the most important interfaces in the entire camera system. As the length of the lens becomes shorter and shorter, the angle of light reaching the pixel position of the sensor will become ever greater. Each pixel has a micro lens. The main function of the micro lens is to focus light from different angles on this pixel. However, as the pixel position becomes more and more large, some light will not focus on the pixels, resulting in loss of light and reduced pixel response. The angle of light entering each image will depend on the position of the pixel, and the light near the lens axis will enter the pixel at a nearly zero angle as the distance from the axis is larger and the angle becomes larger. CRA is associated with the position of the pixel in the sensor. From the lens side of the sensor, the maximum angle of light that can be focused onto the pixel is defined as a parameter called the (CRA). 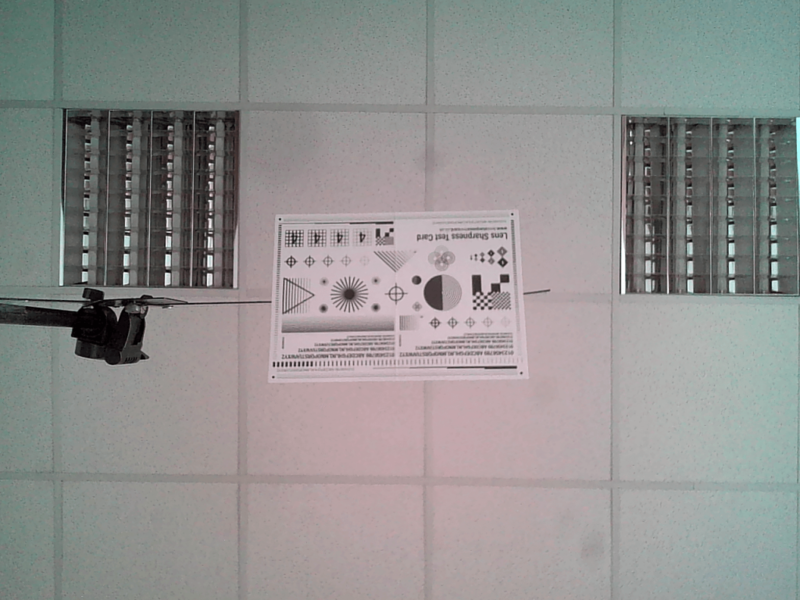 The general definition for the main light angle is that the pixel response at this angle is reduced to 80% of the zero angle pixel response (in this case, the pixel is perpendicular to the ray). 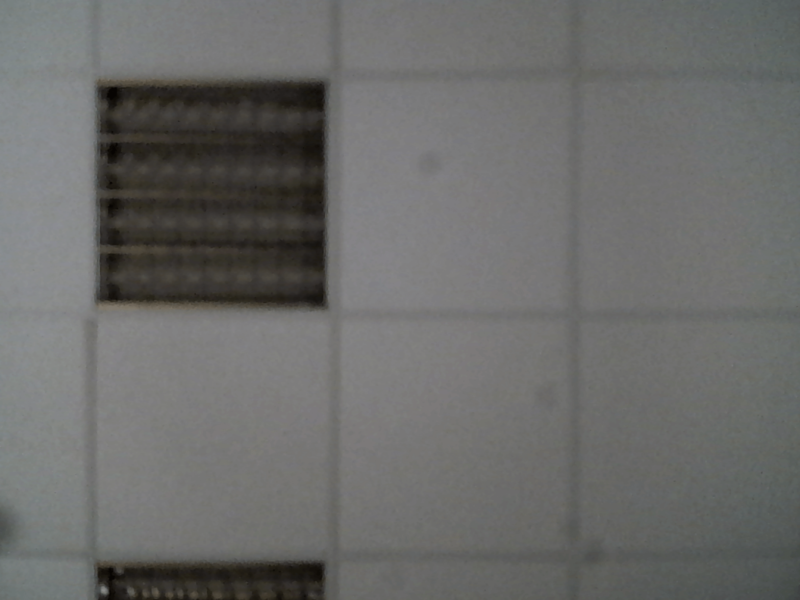 The angle at which the light enters each pixel will depend on where the pixel is located. The light near the lens axis will enter the pixel at an angle close to zero. As it increases with the axis line, the angle increases. CRA is related to the position of the pixel in the sensor, and the relationship between them is related to the design of the lens. Very compact lenses have a very complex CRA mode. If the lens’s CRA does not match the sensor’s microlight design, there will be an undesirable light intensity through the sensor (ie, “shadow” pink glow). By changing the micro-lens design, and the image to the appropriate processing, you can greatly reduce this phenomenon. Changing the micro lens design can greatly reduce the shadow phenomenon and pink glow. However, in changing the microlens design, you must work closely with the lens designer to find the appropriate CRA mode for the various shots. The camera’s design engineer should ensure that this technical cooperation is achieved and that the sensor and lens CRA characteristics are well matched. To ensure the success of this goal, Micron developed the relevant simulation tools and evaluation tools. 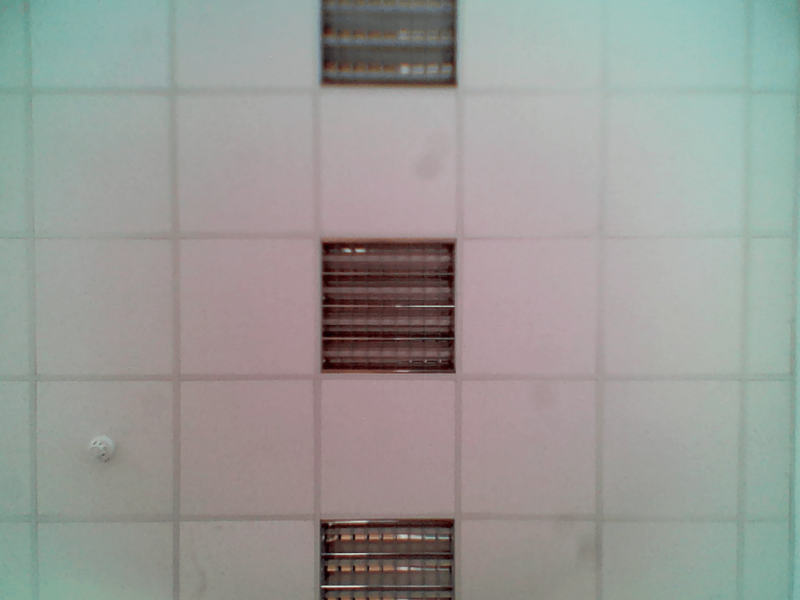 As the light is incident along the different angles on the sensor, so for a variety of miniture lenses design, the shadow phenomenon is inherent. “Cos4 law” shows that the reduced light is proportional to the quadratic of increasing the angle cosine. 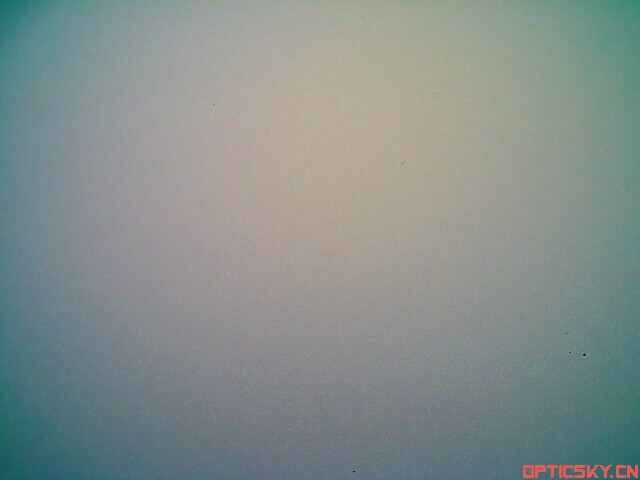 In addition, in some cctv lens design, the megapixel lens itself may block part of the light (known as “halo”), which will also cause shadows. So, even if the micro-lens design can minimize the shadow of the short lens phenomenon, this phenomenon will still exist more or less. In order to provide the camera designer with additional methods to correct shadows, the embedded image processor in the MT9D111 contains shadow correction, which is tailored for certain specific shots. To help design engineers integrate sensors into their products, Micron offers a variety of development software for all of its sensor products. By using these software, the camera design engineer can simplify the modification of the various chip feature defaults. The results of each change can be displayed on a PC monitor. For many cameras used in the camera, through the use of this development system, you can correct the lens shadows and spatial color distortion parameters set. By using a uniformly lit white object, you can simply set the response process for a simple test. The software development tool can display the results of the analysis of the shadow phenomenon. After that, the engineer can use the regional method to apply the correction value. The register settings for the calibration process will be stored in the development system for the camera design. These three parameters are the primary considerations for Lens and Sensor selection. We send two lenses to our client for testing. As the client needs a wider angel lens ,So they choose the the 2.81mm lens,and we fix the pink glow problems in the software. General in the Sensor data sheet will be attached to the full field of view CRA reference value, different sensor manufacturers have different requirements, you can do this in accordance with this design reference. Some Sensor manufacturers in the public data table will not show out, but can ask with them. LENS and SENSOR generally require CRA curve error of +/- 2 degrees, of course, there are other aspects, which I also want to know. 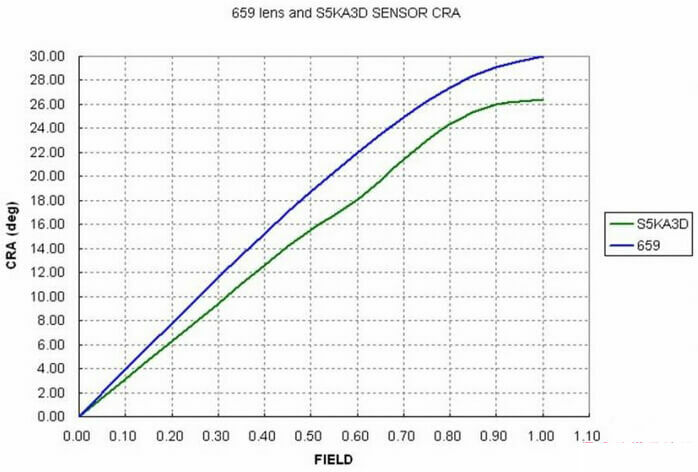 The CRA value of the Lens should be less than the Sensor’s Micro Lens CRA value, otherwise it will cause imaging illumination or color problems. 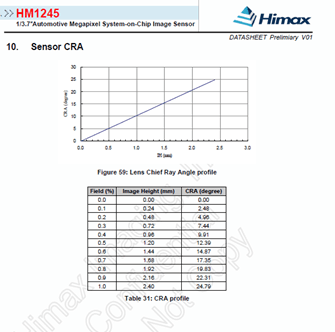 The lens CRA is less than the SENSOR CRA or the lens CRA is close to the SENSOR CRA is the best, the lens CRA and the chip CRA is generally within three degrees. Requires high of 2 degrees Lens CRA does not match Sensor CRA Typical example of color cast: OV9655 / 53/50 Sensor When you use Lens TTL value below 5.0mm to determine the majority of the lens, carefully observe the imaging of the white Screen, you can see the whole picture will be color cast phenomenon.OVT for this problem improved after the Sensor model: OV9656. In the Sensor CRA curve, the vertical axis represents the main ray angle, the unit is the degree, the horizontal axis represents the field of view, there are two representations, one is expressed as a percentage, the maximum effective imaging height of 100%, generally 10% One is directly in mm, in turn from the Sensor center to the maximum imaging height position. SENSOR has a CRA value, which is SENSOR MICRO high resolution lens with the location of the photodiode there is a horizontal error, not in a straight line, made such a certain purpose, according to the usual practice, because SENSOR MICRO LENS and photoelectric There is a certain distance between the diodes, so the purpose is to do with the good LENS. 2.LENS also exists a CRA value, which in the LENS design is to consider the content, according to SENSOR CRA value of the design, the deviation is better within 2 degrees, too much, likely to cause lack of light and color cast. LENS CRA is not the smaller and the better, some people think that 0 is the best, it is not right, can only say that board lens CRA and SENSOR CRA closer and the better.